← To Rise at dawn. Recently I was involved in a conversation with a friend who had collected several Fungi in Her local woods. The pit falls of such endeavours have been well documented and unless you are 100% certain about the edibility of the specimens you find, you really should leave them well alone. Of course not all fungi collected will be utilised has a tasty introduction to a bland risotto or indeed a full on Cream of Mushroom soup, many will be used for simple self gratifying identification thus allowing your own personal knowledge of flora and fauna to be inflated. However We should all be fully aware of the dangers. I can see My introduction to this Article seems rather ominous and counterproductive, But, it really isn’t when you consider the amount of incredibly wonderful Fungi that can be collected with little effort in our woods and forests. Mushrooms have long been associated with Pagan religions and amongst the Druids it was considered taboo for anyone but priests to handle them. The connection between that of Religion and mushrooms would be as a direct result of the hallucinogenic properties of certain types. Many rituals would involve the ingestion of mushrooms with high doses of the psychedelic compounds psilocybin and psilocin. The most infamous of these types of fungi are the so-called “Magic Mushrooms” It is almost impossible to know for certain the exact type of Mushroom that was utilised in Pagan rituals but in the UK these would have been vastly abundant and are more than likely the ones responsible for the arbiter of Visions. It is this type of Folklore that as propelled mushrooms into their place as a sought after delicacy. Of course, not all mushrooms are remotely rare or indeed delectable but some, such as the Morel, that cannot be cultivated and grows wild for only a few months per year, most certainly are! Found between March – May in open woodland predominantly on chalky and sandy soils Morels are very expensive if purchased from even the largest suppliers, this is simply down to labour intensive procurement process due to their rarity. Chefs in Michelin starred restaurants will garnish lavish dished with several Morels as the shape lends itself to such fantastical presentations. I know at 1st hand the difficulty in obtaining Morels in any viable quantity through my attempts to reproduce “Pigs Trotter Pierre Koffman.” One of My other Blogs covered the whole procedure in recreating this iconic dish and I was flabbergasted at the price of just 40 grams of said Morels. Morels have a very elusive flavour, rather musky and earthy, with, in my opinion a quite beefy undertone even a slightly medicinal quality. Many sauces are enriched with morels via a process of reduction, a stock will be reduced over direct heat whilst the morels toss and turn in the liquid like trainers (Sneakers) in the washing machine. This stock is then added to other basic sauce reductions thus yielding its earthy delights to the sauce. Caution must always be applied when picking morels as they have a similar looking inedible cousin. 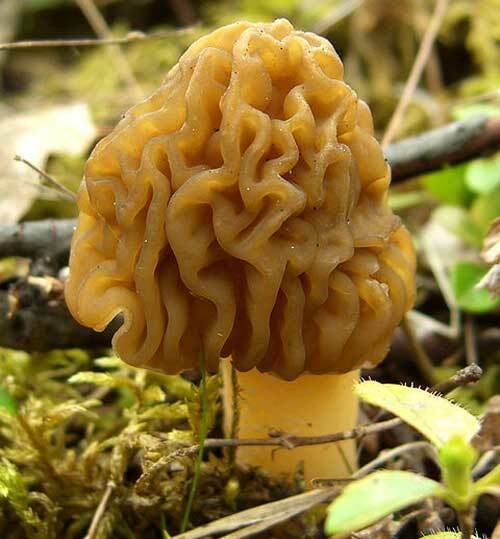 The false morel differs from the true morel in that it is a much paler and insipid looking specimen. Also the Outward mottled appearance of the True morel is in direct contrast to the long wavy lines of the bogus morel. I think the false morel resembles a brain rather than the honey comb configuration of the true morel. 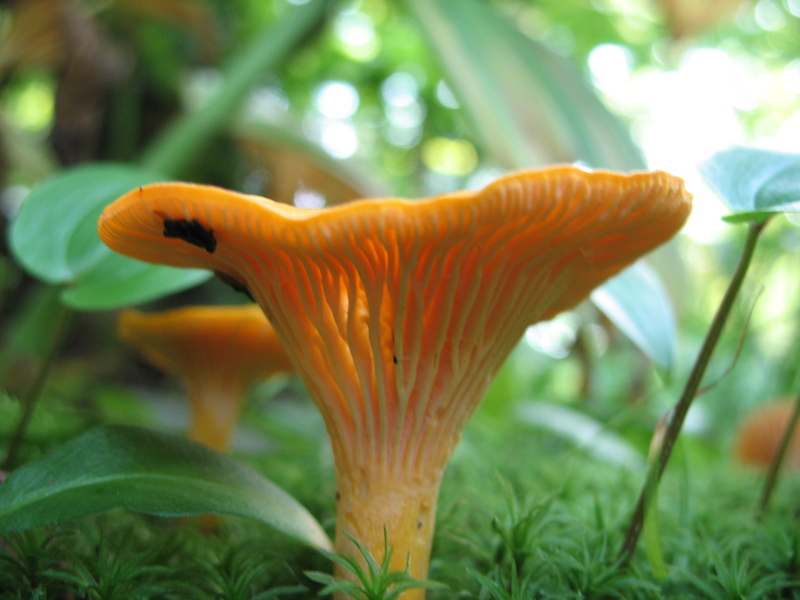 Another notable and highly prized mushroom is the Chanterelle (Girolle / France). Again these Mushrooms have elusive flavour. Much more abundant and easy to find than Morels they are best located in Beech, Birch and Pine woods. They can be picked from July – December. 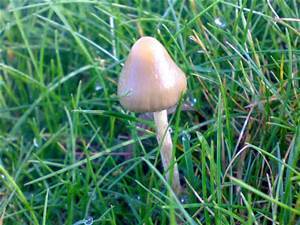 With a Yellow Stem and Upward facing parasol cap they are very distinct. 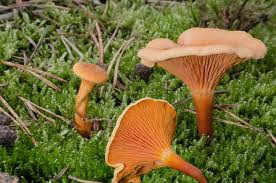 However they do have an imposter “The False Chanterelle.” (left) The false Chanterelle has a much darker stem, almost brown compared to the true Chanterelle (right) Also the cap is lighter in colour with no yellow hue. 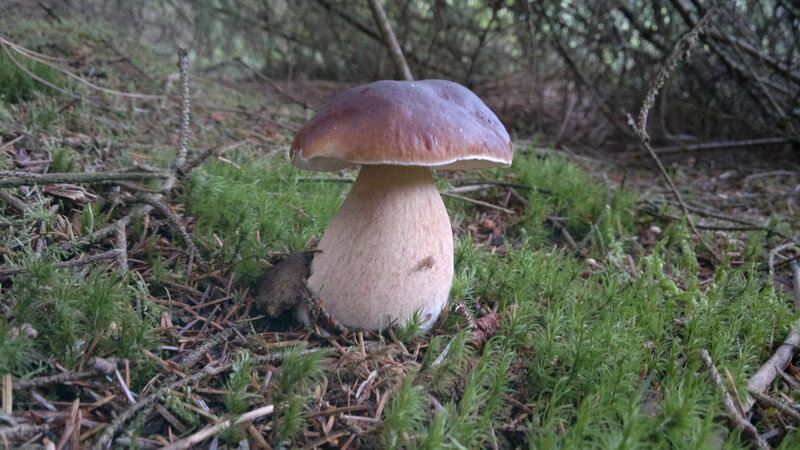 The Cep in France, Porcini in Italy and The Penny bun in The Uk are members of the Boletus family and are the most prized of all wild mushrooms. They are similar to standard field mushrooms inasmuch they both have large domed caps. The cep differs from the field mushroom in that they have tiny tube like structure under the cap as opposed to the gills of the field mushroom. Also, the caps are much darker brown on the Cep, The penny bun name adopted in The Uk was in relation to this dark bread bun appearance. Ceps can be collected all year and are to be found near trees, in open grassy clearings and on the edge of woodlands. Some specimens of Boletus can be huge. Ceps have been found to grow up to 8″ in diameter and weigh as much as 2lbs. Another indicating factor of a true Cep is the white spores they produce that will turn a darker almost yellow colour in older specimens. I have briefly highlighted our most prized edible Mushrooms above for very different reasons. Mainly for the 2 classic recipes that will appear towards the end of this blog, and in the case of the Magic mushroom, simply because it as played an important and infamous roll not only in religion, but also in the visions and experiences of modern-day spiritualists and of course the more self-indulgent and adventurous of us. The toxins contained in Fungi have been know for many years via scientific analysis and dare I say, deadly trial and error. In the UK there are around 3000 Types of Mushrooms with 100 being highly edible and 20 being absolutely inedible. 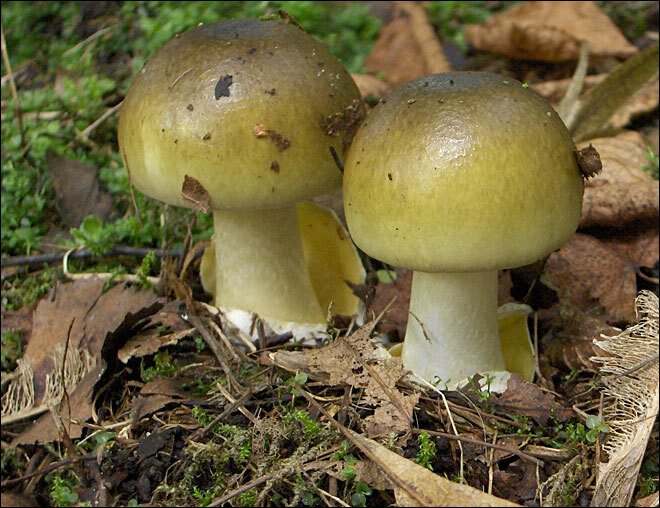 The most notorious of the toxic fungi belongs to the Amanita family. Amanita phalloides commonly known as The Death Cap is the most infamous and arguably the deadliest known Toadstool. This is the fungi that history tells us was responsible for the deaths of Roman Emperor Claudius in AD 54 and Holy Roman Emperor Charles IV in 1740. 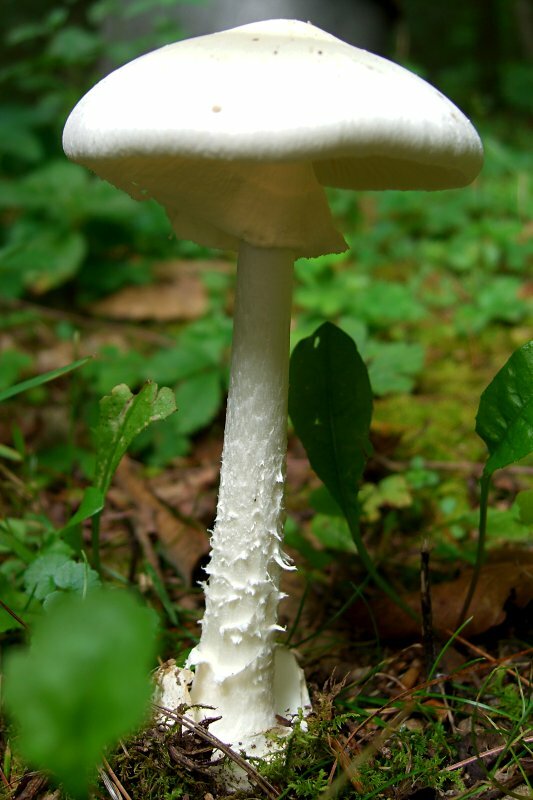 The toxin contained in Amanita Fungi is Primarily Amanitin a deadly Amatoxin, which are some of the most lethal poisons found in nature. These toxins work by slowly shutting down the liver and kidneys. Often the victim will appear sick at first, and then begin to look and feel much better for a period, unfortunately the Amatoxins are still at work, and death may occur anywhere from a few days to a week after ingestion. One of the features to look for when identifying the Destroying Angel is the baggy skirt like growth that appears beneath the cap, it is clearly visible in the photo to the left. When picking wild fungi it is imperative to collect ALL the specimen, as the base of the stem can also have vital signs to aid full recognition. For anyone wishing to have a go at collecting mushrooms for whatever purpose I would urge you to check both of these links –Fungi: mushrooms, toadstools identification, fungus forays … & UK Wild Mushroom Guide, edible and poisonous mushrooms … as they contain much more in-depth descriptions of the fungi available in Europe and further afield. Always be mindful that any guide is only that……. A GUIDE!!! Even professional mycologists have been know to fall foul of foul Fungi..
As I stated earlier I will now give you two of Excellent recipes utilising mushrooms. One is a lasagne and the other My absolute favourite soup. Place the butter into a large heavy pan and melt gently, then add the prepared leeks and sweat for about 10 minutes. Next add the mushrooms and thyme with a small pinch of salt. Allow the mushrooms to cook until they begin to offer up their liquid. Add the crushed garlic and stir well into the pan, cook for 1 minute and add the plain flour. Add the vegetable stock to the pan and bring to a simmer. Cover the pan with a tight-fitting lid and simmer for 20 minutes. Now, remove the sprigs of thyme and using a hand-held blender puree the soup. This is all a matter of preference, I like a very smooth soup so I blend until no trace of the mushrooms are still visible but you can stop at whichever point you wish. Suffice to say, this soup only requires some home made crusty bread by way accompaniment. Sieve the flour and salt into a large bowl, make a well in the centre and add the olive oil and eggs. Now, bring the flour, eggs and oil together with your hand. Turn the dough out onto a floured work surface and knead for 5 minutes. Once the dough is smooth wrap it in cling film and refrigerate for 30 minutes. Pour the milk into a deep pan and add the carrot, bay leaf and onion. Bring the milk to a simmer and then remove from the heat. Allow the milk to infuse with the solids for at least 1 hour. Now, Melt the butter in a clean pan and carefully stir the flour into the butter. Once well blended allow the Butter and flour to cook for 2 minutes ( This cooks the raw starch from the flour) Next, slowly add the milk via a sieve (warm it if you wish, however I never do and it always works just fine ) Once the milk is in the pan stir continuously and allow the milk to thicken Slowly. Once thickened the Béchamel needs to be seasoned with salt, pepper and Nutmeg. Set the Béchamel to one side and add a touch more milk if it becomes to thick. In a wide heavy based frying pan warm the olive oil and when medium hot add the mushrooms. Do this in several batches as the idea is to fry them until they are part cooked rather than steam them in their own liquid. Place a layer of béchamel in the base of a 25cm x 20cm enamel lasagne tray and then lay a sheet of pasta on top. Layer some mushrooms and ham on the pasta sheet followed by some more béchamel and a 3rd of the parmesan. Next place another later of pasta into the tray. Repeat this layering process until all the elements are incorporated into the tray, ensuring you finish with a layer of pasta, some béchamel and finally the remaining Parmesan. Place the lasagne in the top half of the oven and cook for 25-30 minutes. The top should be golden brown and bubbling. You could always place the lasagne under the grill briefly to obtain the correct Browning..
A simple green leaf salad is the perfect accompaniment to this earthy and fulfilling dish. This entry was posted in Dangers, Discovery, self-sufficiency and tagged cooking, foraging, Mushrooms, wilderness. Bookmark the permalink.